For millennia, the night sky has provided continuity to the ancient cultures of our forebears. Although the star-filled night sky has largely disappeared for most of us in this age of electricity, advancements in science and technology have sustained astronomy as a unifying force in our imagination. 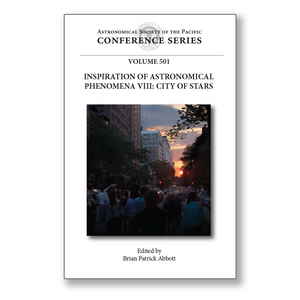 The Inspiration of Astronomical Phenomena (INSAP) examines how astronomy influences past and present cultures. The conference brought together experts in art, architecture, music, literature, history, and archeology, who investigate the role astronomy plays in their fields of study. INSAP participants approach these topics from a variety of directions. Some are moved to explore the minds of historical artists or scientists. Others are inspired to create original works of art, music, or literature. Still others explore relationships between these topics through science and visualization.INSAP VIII, City of Stars, brought together people who study astronomy's influence on topics as diverse as Shapley and Superman, Petra and Padua, and calendars and cathedrals. This volume demonstrates that astronomy has been, and remains, an important part of our culture, and that it enriches our heritage and experience on earth.